Brunswick Valley Landcare regularly applies for grants to run onground projects. Below you can find details on current and past projects. Brunswick Valley Landcare in conjunction with Byron Shire Council, has been successful in its recent application for a NSW Government funded Fish Habitat Action grant from the Department of Primary Industries. Brunswick Valley Landcare have been working in the popular spot known locally as Shaleys Corner, Casons Lane, New Brighton. 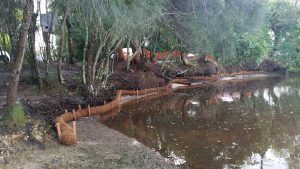 The aim is to revegetate the currently eroding creek banks using native trees, shrubs and sedges. Once established the root systems of the native vegetation should aid in greatly reducing any further erosion of the creek bank. Areas that have already suffered from erosion have degradable coir logs installed to aid in establishment of native plants. Weeding of non-native species has also occurred. 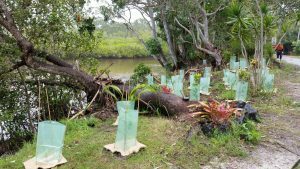 The project has formed partnerships and consulted with National Parks and Wildlife Service, Cape Byron Marine Parks, Ocean Shores Country Club, Madhima Gulgan Community Association (Aboriginal Bush Regeneration Team) and Nature Ally Bush Regeneration. Marshalls Creek is an important nursery area for many fish species and has areas of important vegetation such as mangroves, sea grass meadows, saltmarsh and the Endangered Ecological Communities – Swamp Sclerophyll Forest on Coastal Floodplains of the NSW North Coast and Coastal Floodplain wetlands. Marshall’s Creek and New Brighton are a culturally significant place to the Aboriginal people of the area. This area is rich in resources from food, tools and medicines. These resources were and still are collected by the Aboriginal families living in the area today. Owl Box number 12 in Brunswick Valley Landcares Nest Box Project has been generating a lot of excitement! It contains evidence that three different creatures have made their home in it, or at least tried to. The boobook perched on a nearby branch is the latest occupant. I believe at least two of the eggs inside are hers. A whole lot of wood duck down feathers and the other two eggs in the box lead me to believe that a wood duck was interrupted in her brooding and chased from the box. In the winter there were lots of leaves in this box and a squad of gliders … this photo from June 2016. 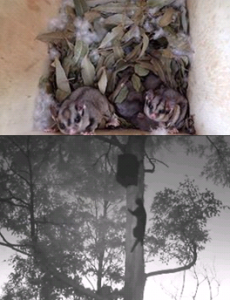 Brunswick Valley Landcare’s Nestbox project started in 2014 after a successfull crowd funding campaing to raise funds to install owl nest boxes. It has not gwon and we have installed 40 nest boxes over the last 2 years, and lots of different kinds of boxes, not only ones for owls. We monitor the boxes regularly and add the information to our database. The monitoring has sown that hollows must be in short supply as 60% of our boxes are occupied and some within 3 months of being installed. To borrow a cat trap please contact Byron Shire Council.